Happily the day after Black Friday (the big shopping day following Thanksgiving) is small business Saturday. 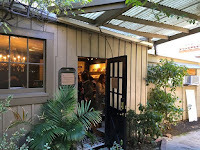 On this day, I headed to The Chocolate Garage (Palo Alto, CA) with family members to enjoy chocolate at its best. At this small but very well-stocked, chocolate speak-easy, we found "The Dude White Russian - chocolate twig with Kahlua, Vodka and Cream" from SOMA Chocolatemaker (Toronto, Canada). 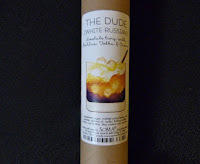 Packed inside a cardboard tube, The Dude White Russian was a very tasty chocolate implementation of a White Russian (cocktail*)— favored by protagonist Jeffrey Lebowski, aka "The Dude" (played by Jeff Bridges), in the movie The Big Lebowski. I suggest seeing this cult favorite to fully appreciate the reference. However, movie or not, I really enjoyed eating and sharing this delicious, slightly boozy chocolate confection. Today was Day #2 of Chocolate and Holiday Spirits Theme Week. *A White Russian is made with vodka and Kahlua (coffee liqueur) over a few ice cubes, and topped with generous splash of cream.